EcoCortec Adds New Plant Featured in FSE Magazine! Cortec Offers VpCI Premium Corrosion Inhibiting Papers to Preserve Environment Featured in Compelo Magazine! Cortec Preserves the Environment with Corrosion-Inhibiting Papers Featured in Auto Parts Magazine! EcoCortec Inaugurates Bioplastic and Anti-Corrosion Film Plant in Croatia Featured in Packaging World Magazine! Compostable Plastic Bags Featured in Crown Publications! Cortec Offers Biodegradable Shopping Bags Featured in The Packer Magazine! Minimizing Environmental Impact of Common Plastics with Recyclable and Compostable Films Featured in Manufacturing Magazine! Minimizing Environmental Impact of Common Plastics with Cortec® Recyclable and Compostable Films and Bags Featured in BioBased Magazine! Minimising Plastic Waste with Cortec Compostable Bags Featured in Eco Magazine! Minimizing Environmental Impact Of Common Plastics With Cortec® Recyclable And Compostable Films And Bags Featured in Plastics Technology Magazine! EcoCortec®, Manufacturer of VpCI® Anticorrosion Packaging Opened Second Plant in Croatia Featured in TIPS Magazine! New Croatian Plant for Corrosion-Inhibitor Packaging Featured in MP Magazine! EcoCortec: New Plant for Packaging Films in Croatia Featured in Plastics Information Magazine! 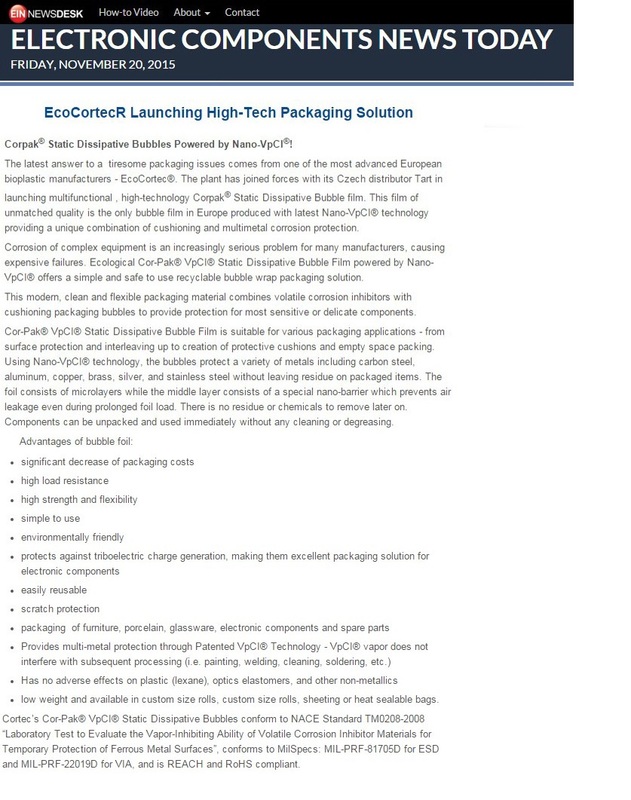 EcoCortec®, Manufacturer of VpCI® Anticorrosion Packaging Opened Second Plant in Croatia Featured in Bio Based News! EcoCortec Opens New European Plant Featured in Crown Publications! EcoCortec Opens Second Plant in Croatia Featured in Bioplastics Magazine! 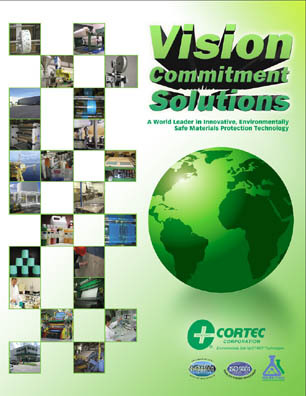 EcoCortec®, Manufacturer of VpCI® Anticorrosion Packaging Opened Second Plant in Croatia Featured in IPCM Magazine! EcoCortec opens second production plant in Croatia Featured in Plastic News! EcoCortec® Ribbon Cutting Ceremony Featured in Plastics Technology Magazine! Croatian EcoCortec® Plant Receives Best Supplier Award Featured in IPCM Magazine! Successful Year for Fast Growing Anticorrosion Packaging Producer Croatian EcoCortec® Plant Receives Best Supplier Award Featured in SMT Magazine! Croatian EcoCortec Plant Receives Best Supplier Award Featured in MHW Magazine! Croatian EcoCortec Plant Receives Best Supplier Award Featured in Coatings World Magazine! Impact of Traditional vs New BioBased Rust-Preventative Temporary Coatings Featured in PCI Magazine! EcoCortec® Partner in European BIOCOMPACK Promoting Sustainable Packaging Featured in Food Marketing & Technology Magazine! New Production Facility for Corrosion Inhibitor Packaging Featured in Materials Performance Magazine! EcoCortec Joins European BIOCOMPACK Project Featured in Biobased Magazine! EcoCortec joins European BIOCOMPACK Project Featured in Bioplastics Magazine! Ecocortec® Announces Partnership in European Biocompack Project Featured in Packaging Europe Magazine! Croatian Bioplastics Maker Joins Packaging Consortium Featured in BioFuels Digest Magazine! 2024 Vision for Global Plastic Recycling Industry Featured in Plastic Recycling Magazine! Time, Labor and Cost Savings with Cortec's Multifunctional, Safe Solutions for Export Packaging Featured in Engineering Review Magazine! EcoCortec Announces Partnership in BIOCOMPACK Project Featured in Europe Plastics Magazine! Cortec® Introduces Ecoshield® Super Barrier Paper and Linerboard Featured in Food & Engineering Magazine! Cortec® Introduces Ecoshield® Super Barrier Paper and Linerboard Featured in Paper World Magazine! Cortec Ecoshield Super Barrier Paper and Linerboard Featured in Packaging Magazine! Cortec® Counters Costs and Hassle of Metal Corrosion with CorShield® 352 Coating for Paper and Corrugated powered by Nano VpCI® Featured in IPCM Magazine! Cortec® Prevents Metal Corrosion with Corshield® 352 Coating Featured in Packaging Europe Magazine! Moisture-Resistant Paper and Linerboard is fully Recyclable Featured in the Fabricator Magazine! EcoCortec Expands with New Facility Featured in Flow Control Magazine! EcoCortec Manufacturing Plant Expansion Featured in Packaging Gateway Magazine! EcoCortec Expands with New Facility Featured in Processing Magazine! Cortec® Introduces Ecoshield® Super Barrier Paper and Linerboard Featured in Inside Industry Magazine! Cortec's Eco-Friendly EcoShield Replaces Unrecyclable Polycoated and Waxed Paper Featured in Bakery Magazine! Cortec® Introduces Ecoshield® Super Barrier Paper and Linerboard Featured in Packaging Europe Magazine! New Facility to Open in Croatia for Vapor Corrosion-Inhibitor Packaging Featured in Materials Performance Magazine! Additional Capacities for Anti-Corrosive Films / Investment in Production in Croatia Featured in Plastics Information Magazine! Additional Capacities for Anti-Corrosive Films / Investment in Production in Croatia Featured in Plast Europe Magazine! EcoCortec – Biggest European Producer of Anticorrosion Films and Bags is Building a New Facility Featured in HealthCare Packaging Magazine! EcoCortec New Facility Featured in Converter Magazine! EcoCortec Expanding with New Facility Featured in Packaging Europe Magazine! EcoCortec Builds New Facility to Boost Manufacturing Featured in Food Marketing & Technology Magazine! Croatian Producer of Anti-Corrosion Films and Bags Expands to Meet Global Demand Featured in Plastics Magazine! EcoCortec to Build New VpCI Films and Bags Plant in Croatia Featured in Packaging Gateway Magazine! EcoCortec Builds New Facility in Croatia Featured in European Coatings Magazine! EcoCortec Selects Contractor for New Facility in Croatia Featured in on Polyestertime Magazine! EcoCortec Building New Production Facility in Croatia Featured in CPRJ International Magazine! EcoCortec to Build New Croatian Facility Featured in Packaging News! Croatian Producer of Anti-Corrosion Films and Bags Expands to Meet Global Demand Featured in Plastics Today Magazine! EcoCortec Building New Factory in Beli Manastir, Croatia Featured in Coatings World Magazine! EcoCortec Selects Contractor for New Facility in Croatia Featured in Packaging Technology Magazine! European Recycling Project for Corrosion-Inhibiting Plastic Films Featured in Materials Performance Magazine! Cortec EcoShield® VpCI®-226 and EcoShield® VpCI®-144 Featured in Food Trade Journal! 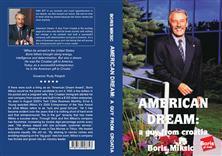 Premium High Tech Cortec® VpCI® Papers Now Custom Converted In Croatia Featured in American Printer Magazine! Premium High Tech Cortec® VpCI® Papers Now Custom Converted In Croatia Featured in Packaging Europe Magazine! Premium High Tech Cortec® VpCI® Papers Now Custom Converted In Croatia Featured in Pulp and Paper Magazine! Recycling Project Begins in Europe for Corrosion-Inhibiting Plastic Films Featured in Materials Performance Magazine! Cortec Products Recertified as Compostable Featured in PFFC Magazine! Cortec's Breakthrough Formulation Featured in Special Chem Magazine! Plastic Recycling Market: Global Industry Analysis,Trends and Forecast 2024 Featured in Open PR Magazine! EcoCortec's Plastic Recycling Project "First of its Kind" in Europe Featured in Recycling International Magazine! Ecocortec® Launches First European VpCI® Plastics Recycling Project Featured in EP Magazine! Ecocortec® Launches First European VpCI® Plastics Recycling Project Featured in Plastics and Rubber Journal! Ecocortec® Launches First European VpCI® Plastics Recycling Project Featured in Packaging Europe Magazine! MCI Technology Preserving War Destructed Monument and Symbol of Croatian Independence Featured in Oil and Gas Platform Magazine! MCI technology preserving war – destructed monument and symbol of Croatian independence Featured in The Governance Magazine! Iconic tower in Croatia's Vukovar to be restored as war memorial Featured in Ebl News! Cortec's EcoSonic ESD Paper Featured in Packaging Europe Magazine! Croatian independence monument restored Featured in Engineering Specifier Magazine! 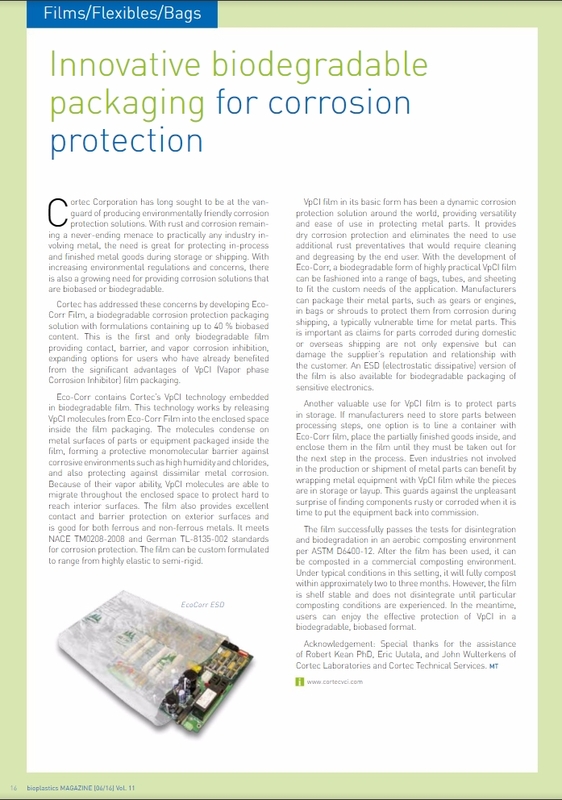 Innovative Biodegradable Packaging for Corrosion Protection Featured in BioPlastics Magazine! Croatia and Usa Strengthening Connections Featured in IPCM Magazine! 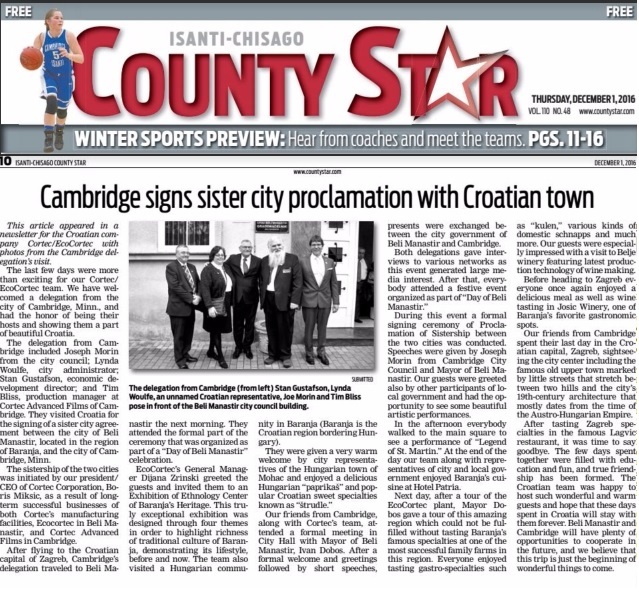 Cambridge signs sister city proclamation with Croatian town Featured in County Star Magazine! Revolutionary USDA Certified Biobased and Biodegradable System for Metalworking Industries Featured in Packaging Europe Magazine! Cambridge delegation visits Sister City in Croatia Featured in Cambridge Newspaper! Croatia and USA Strengthening Connections Featured in Construction Technology Magazine! Cortec® Corporation Initiates Sistership Between Beli Manastir and Cambridge, MN Featured in Packaging Europe Magazine! Cortec Acquires CorteCros Featured in Coatings Tech Magazine! EcoCortec® Europe's Biggest Producer of Anticorrosion Resealable Bags Featured in Construction Technology Magazine! EcoShield® Nitrite Free Film Powered by Nano-VpCI Featured in Packaging Europe Magazine! Cortec Acquires Croatian Subsidiary Featured in Crown Magazine! EcoCortec® Europe's Biggest Producer of Anticorrosion Resealable Bags Featured in Packaging Europe Magazine! EcoCortec Increase Capacity to Over 1 Million VpCI Bags Per Day Featured in CPRJ Magazine! New Equipment Helps EcoCortec Become Europe’s Largest Maker of Anti-Corrosion Resealable Bags Featured in Flexible Packaging Magazine! Best Selling Anti-Corrosion Film Globally Celebrating 25th Anniversary Featured in Inside Marine Magazine! Best Selling Anti-Corrosion Film Globally Celebrating 25th Anniversary Featured in AZO Materials Magazine! Anti-Corrosion Film Celebrates 25th Anniversary Featured in Packaging Europe Magazine! Anti-Corrosion Film Celebrates 25th Anniversary Featured in World Pipelines Magazine! EcoCortec Celebrates Tenth Anniversary Featured in PFFC Magazine! Latest High Tech Packaging Solutions From EcoCortec® Featured in Packaging Europe Magazine! Cortec acquires CorteCros Featured in Energy Global Magazine! CorteCros Moves from Oil Giant INA to Full Ownership of Cortec® Corporation Featured in AZO Materials Magazine! Cortec® Corporation Acquires 100% of CorteCros Featured in Oil-Gas Magazine! CorteCros Moves from Oil Giant INA to Full Ownership of Cortec Corporation Featured in Packaging Europe Magazine! EcoCortec Celebrates 10th Anniversary Featured in Sustainable Manufacturer Magazine! New Age Packaging Technology from Croatia Featured in Construction Technology Magazine! EcoCortec Celebrates 10th Anniversary Featured in WWD Magazine! EcoCortec Celebrates 10th Anniversary Featured in Special Chem Magazine! EcoCortec Celebrates 10th Anniversary Featured in Special World Cement Magazine! New Age Packaging Technology from Croatia Featured in Packaging Europe Magazine! New Age Packaging Technology from Croatia Featured in AZO Materials Magazine! CorPak Bubbles Featured in April Issue of Packaging World Magazine! Cortec Presents Record Number of Technical Papers at Eurocorr 2016! Featured in Food & Beverage Magazine! 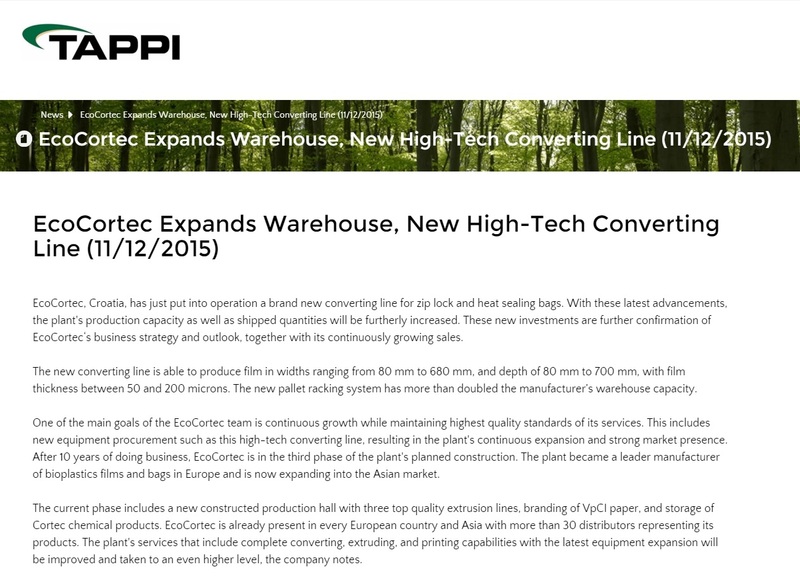 EcoCortec Expands Warehouse, New High-Tech Converting Line Featured in Tappi Magazine! Workshop Seminar on VpCI® Corrosion Inhibitors Organized by Faculty of Mechanical and Naval Engineering Featured in Zavarivanje Magazine! EcoCortec Launches Cor-Pak Bubble Film to Protect Sensitive Components Featured in Beverage Daily Magazine! Cortec®'s BioEmitter™ Featured in the Fabricator Magazine! EcoCortec Expands Capacity with New Converting Line Featured in Plastic Insight Magazine! Static-Dissipative Bubble Film Offers Cushioningn Featured in The Fabricator Magazine! EcoCortec® Launching High-Tech Packaging Solution Featured in EIN Magazine! EcoCortec Launches Bubbles Packaging Solution Featured in Packaging Business! Ecocortec Launches Bubble Film for Packaging Applications Featured in China Resources Magazine! EcoCortec® Launching High-Tech Packaging Solution Featured in American Printer Magazine! EcoCortec Launching Bubbles Packaging Solution Featured in Converter News! EcoCortec - New Bubble Film Introduced Featured in Packaging Films Magazine! EcoCortec Expands Capacity Featured in Bio Based News! EcoCortec Launches Bubbles Packaging Solution Featured in Packaging Gateway Magazine! EcoCortec Launches Bubbles Packaging Solution Featured in Food Production Magazine! EcoCortec Expands Capacity With New Converting Line Featured in Bioplastics Magazine! EcoCortec Commences Operations of New Converting Line at its Croatian Plant Featured in Packaging Gateway Magazine! EcoCortec® Increases Heat Sealing Bags Production Capacity with New Converting Line Featured in Sustainable Packaging Magazine! EcoCortec® Announces Expanded Warehouse and New Converting Line Featured in Packaging Europe Magazine ! Protective Coatings Featured in the IPCM Magazine! Multinational Giant Utilizing EcoCortec®'s High Tech, CoExtruded Static Dissipative Bags Featured in Plastics and Rubber Journal! Multinational Giant Utilizing EcoCortec®'s High Tech, CoExtruded Static Dissipative Bags Featured in Inside Marine Magazne! Fulfilling a Challenging Order for VCI and ESD Dissipative Bags Featured in Wix Technology Magazine! Fulfilling a Challenging Order for VCI and ESD Dissipative Bags Featured in Electronic News! Multinational Giant Utilizing EcoCortec®'s High Tech, CoExtruded Static Dissipative Bags Featured in Packaging Europe Magazne! Multinational Giant Utilizing EcoCortec®'s High Tech, CoExtruded Static Dissipative Bags Featured in Engineering News Magazne! Multinational Giant Utilizing EcoCortec®'s High Tech, CoExtruded Static Dissipative Bags Featured in Process Industry Magazne! CorShield ® VpCI®-146 Creped Paper Featured in Packaging Europe Magazine! EcoSol® Water Soluble Film Technology - Newest Generation of Packaging Solutions! Featured in Engineering News Magazine! EcoCortec – ISO 9001 and 50001 Certification Audit Completed Featured in Packaging Films Magazine! First Croatian Bioplastics Plant Announces Iso 9001 And Iso 50001 Certification Featured in Plastic and Rubber Journal! First Croatian Bioplastics Plant Announces Iso 9001 And Iso 50001 Certification Featured in Packaging Europe Magazine! First Croatian Bioplastics Plant Announces Iso 9001 And Iso 50001 Certification Featured in Bio-fibre Magazine! Croatian Bioplastics Facility Gains Iso Certification Featured in WWW Magazine! EcoCortec- First Croatian Bioplastics Plant Announces ISO 9001 And ISO 50001 Certification! EcoCortec first BioPlastics Plant in Croatia in Contract Pharma Magazine! EcoCortec®, Croatian Bioplastics Plant to Receive ISO 9001 and ISO 50001 Certification ! EcoCortec first BioPlastics Plant in Croatia in Topix Magazine! Cortec Offers Fire-Retardant Shrink Film Featured in PFFC Online Magazine! The Shrink Wrap Impervious to Anything Nature Can Inflict! Latest Export Packaging Advancement From EcoCortec d.o.o. Croatia Featured in Packaging Design! EcoCortec Featured in Plastics Rubber Asia Magazine! Custom Fabricated Equipment Covers and Hoods Powered by Nano-VpCI&REG; Featured in IPCM Magazine! Latest Export Packaging Advancement from EcoCortec® d.o.o. Croatia: Custom Fabricated Equipment Covers and Hoods Powered by Nano-VpCI®! Featured in Azo Materials Magazine! Latest Export Packaging Advancement from EcoCortec® d.o.o. Croatia Featured in Packaging Europe Magazine! Flexible Packaging Shrinks Transportation Costs, Carbon Footprint Featured in Environmental Leader Magazine! The Most Advanced European Manufacturer of Films and Bags is Doubling its Capacities Featured in Food Processing Magazine! Europe's Biggest VCI/VpCI® Plant Just Got Bigger Featured in Coatings Pro Magazine! Europe's Biggest VCI/VpCI® Plant Just Got Bigger Featured in Packaging Europe Magazine! EcoCortec's success in Marine Clean Project Featured in Bio Based EU Magazine! Europe's Biggest VCI/VpCI® Plant Just Got Bigger Featured in Package Design Magazine! EcoCortec Adds New Extrusion Line to Increase Capacity Featured in Packaging-Gateway Magazine! EcoCortec Expands its Plant to Meet Customer Demand Featured in Packaging Business Magazine! Cortec European Plant Expands Featured in Flexible Packaging Magazine! Cortec Expands Production of Corrosion Inhibitors in Europe Featured in Chemical Engineering Magazine! EcoCortec Expands Plant Featured in Water & Wastes Digest Magazine! Europe's Biggest VCI/VpCI® Plant Just Got Bigger Featured in Engineering News! EcoOcean Featured in Plastics and Rubber Asia Magazine! EcoCortec Develops Marine Degradeable Film to Help Reduce Debris Featured in Plastics News Magazine! EcoCortec Develops 100% Marine Biodegradable Film and Bags Featured in Packaging Material Magazine! EcoCortec Featured in Packaging Europe Magazine! EcoShield, an Environmentally Friendly Moisture Barrier Paper Featured in EcoSeed Magazine! EcoCortec Is Set to Participate in an International Marine Clean Project Featured in Trade China Magazine! Cortec Presents Patented EcoShield Paper and Linerboard Featured in Plant Engineering! Cortec Environmentally Friendly Moisture Barrier Paper Featured in Packaging World! EcoCortec's EcoOcean® Biodegradable PHA Films Help Combat the Problem of Marine Litter Featured in Special Chem! Our Oceans Clean-Up Gets a Boost Featured in Packaging News! EcoOcean Latest-Technology in Preventing Marine Litter Featured in Packaging Design Magazine! Cortec® Milcorr®: Stronger Than Mother Nature Featured in IPCM Protective Coatings! EcoCortec's EcoOcean® Biodegradable PHA Films Featured in Special Chem 4 Bio Magazine! EcoCortec's Success in Marine Clean Project Featured in Packaging Europe Magazine! Influence of Inhibitors Featured in Lube Magazine! Shrink Films Brochure Featured in Packaging Europe! Shrink Films Brochure Featured in New Equipment Digest! 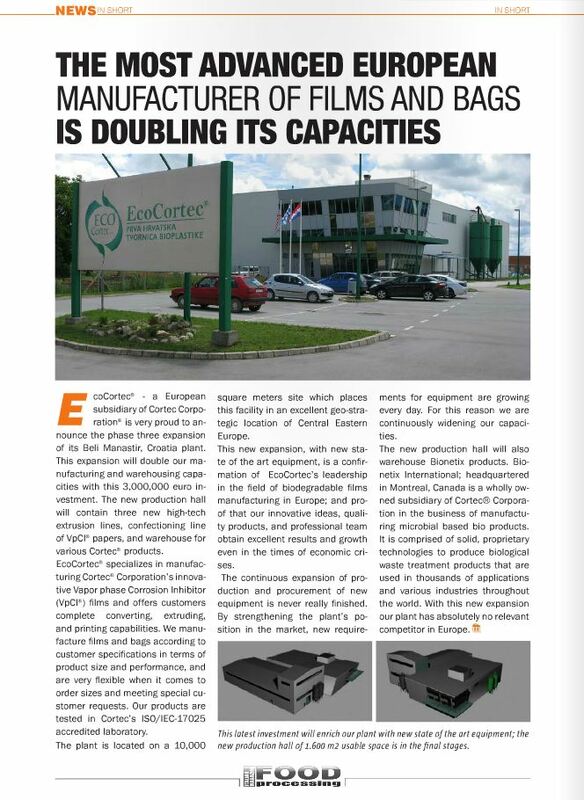 EcoCortec Doubles Its Capacity Featured in PPFC! B. A. Miksic et al; Materials Performance, March 2009. Innovative Technology of Biodegradable Packaging in Croatia –Why Not?